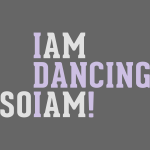 I am dancing so I am! Ready to party? Your motto is to dance all night and to celebrate your friends and yourself? Let's go to the club or turnament and show the crowd your passion! Im Tanzen bin ich Sonderklasse!